Oliveto, a lovely holiday house, is situated on a hill just 5 km from Siena. There are a total of 10 holiday houses and apartments on the property. 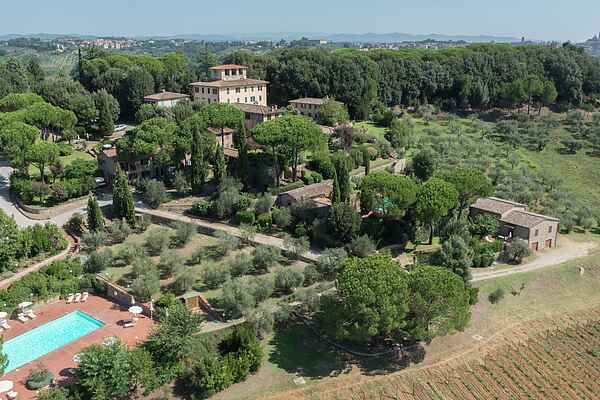 The houses are surrounded by vineyards, olive trees and fruit trees, with a panoramic view of the Tuscan hills. Limonaia is a holiday house with a terrace with garden furniture. The interior design has a nice ambience. It is a tranquil location in the country, ideal for a quiet and relaxed holiday. There is a swimming pool, equipped with sun loungers, chairs and sun umbrellas. The pool is within walking distance from all the holiday houses. Siena is a beautiful medieval town known for the Piazza del Campo, a square in the middle of the town. The famed Palio, a horse race, takes place here twice a year. Visit the Duomo, with sculptures by Michelangelo. The surrounding area is a landscape of gently rolling hills with cypresses, villas and castles. San Gimignano and Monteriggioni Castle are well worth a visit as well.